Joanne Rowling, better known as JK Rowling, the author of the internationally acclaimed Harry Potter series, was delighted to receive a Doctor of Laws (LLD). In December 2002, the University announced the launch of a new MS Society Senior Fellowship. In a new approach to research, the MS Society awarded a grant to the Institution to create a special MS Research Group, met by a substantial donation from JK Rowling, who is Patron of the MS Society Scotland. Professor Neva Haites, Head of the University's College of Life Sciences and Medicine, told assembled graduates at Thursday’s 11am ceremony: "JK Rowling is best known because of a book that she wrote in a cafe in Edinburgh which has made her a household name. "Harry Potter And The Philosopher's Stone and the subsequent Harry Potter books have now been read by millions worldwide. "However, what is less well known is Ms Rowling's significant contribution to many charitable causes." She added that an example of this was the author's role as patron of the MS Society Scotland. She said: "For this and her many contributions to society, I have the honour to recommend JK Rowling to you for the degree." When asked what the degree meant to her, she said: "I am thrilled - it is very exciting." Ms Rowling, who has already been honoured for her contribution to literature by St Andrews, Edinburgh and Napier Universities, added that this degree was "particularly meaningful". In addition to JK Rowling receiving her honorary degree, Peter Boyle, Professor of Cancer Epidemiology, Birmingham University, received a Doctors of Science (DSc) at the same ceremony. Professor Boyle is Professor of Cancer Epidemiology at Birmingham University, Honorary Professor of Cancer Prevention at Oxford University and Visiting Professor at Glasgow University. In January 2004 he became the Director of the International Agency for Research on Cancer in Lyon, France. His main research interests lie in disease prevention and he is particularly interested in the association between tobacco, nutrition, hormones and cancer risk and how this risk is affected by genetic susceptibility. In 2000, he was honoured by the award of the Knight's Cross of Order of Merit of the Republic of Poland, for contribution to Public Health in Poland, and by election to Fellowship of the Royal Society of Edinburgh. Professor Fiona Gilbert, Roland Sutton Chair of Radiology at the University promoted Professor Boyle. She said: “Professor Peter Boyle has published over 500 peer reviewed articles in national and international journals and is co-editor of 15 books. His particular interest is disease prevention, focussing on cancer risk associated with tobacco, nutrition and hormonal factors. He is interested in the interaction of these factors with genetic susceptibility. “His expertise in cancer epidemiology is recognised internationally and he has been a visiting Professor in Canada, Russia, Austria, Spain, Glasgow and Oxford. He was made Fellow of the Royal Society of Edinburgh in 2000. He has received honours from Poland and Hungary and has been made an honorary member of the European Society of Therapeutic Radiation and Oncology. “He has sat on numerous scientific committees and advisory boards in Europe and America advising on cancer policies and also tobacco control recommendations. He is a regular adviser to the Scottish Cancer Group at the Scottish Executive. One of his most recent contributions has been advising the Scottish Executive on smoking policies in Scotland resulting in the landmark ban of smoking in public places this year. “For his contribution to cancer epidemiology and public advancement of disease prevention in Scotland, I have the honour to recommend Professor Peter Boyle to you for the degree." 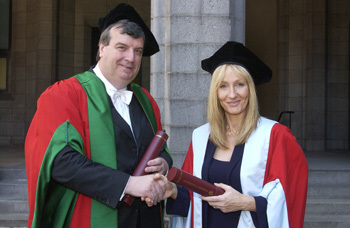 Pictured above are Professor Boyle and JK Rowling, following their graduation ceremony on Thursday, July 6. In all, the University will award honorary doctorates to 20 leading figures in the arts, science, medicine, religion, and industry in this year’s graduation ceremonies which take place in Aberdeen’s Marischal College from Monday, July 3 - Friday, July 7, 2006.